Globalstar Europe Satellite Services Ltd., a wholly owned subsidiary of Globalstar Inc. (NYSE MKT: GSAT), has announced that SPOT Gen3 will track and safeguard more than 850 athletes competing in the MARATHON DES SABLES 2019 (MDS), the world’s most extreme running race across the Sahara Desert in Morocco — Globalstar has been named the Official Tracking Partner for this year’s event, which takes place from April 5 through 15, 2019. Each MDS participant will have the small, rugged, SPOT Gen3 mounted on their backpack, transmitting their GPS location every few minutes so that race organizers, emergency support teams, sponsors, family and friends can precisely track each runner’s location online. This is accomplished thanks to Globalstar’s next generation fleet of satellites traversing the planet in LEO, enabling reliable, ubiquitous coverage even when alternative communications infrastructure is non-existent. SPOT Gen3 was first used by MDS in 2015. That year, thanks to SPOT’s GPS data transmission and emergency notification capabilities, during the course of the event the MDS support team was able to precisely locate 18 competitors in distress and quickly dispatch rescue teams to each. In fact, in the last three races supported by SPOT, no fewer than 45 competitors have been rescued within minutes thanks to SPOT Gen3. MDS race marshals also carry SPOT Gen3s and they will be deployed in security and medical vehicles and helicopters in 2019. In the 2015 race, the use of SPOT Gen3 even resulted in one rescue with the help of a camel. If an incident occurs, such as injury, a runner simply presses SPOT’s one-touch SOS button and their location data is transmitted by satellite from the SPOT device to race officials, making it easy to find the closest rescue team and to promptly dispatch support. Customized tracking software, including an intuitive user interface, is provided by tracking specialist GlobalPlus, a Globalstar Value Added Reseller based in Spain. The GlobalPlus platform uses geo-fencing to alert race HQ if an athlete wanders off course, raising an instantaneous alarm. When this happens, the rescue and medical team will check the person’s health and, if they are OK, advise them as to how to get back on course. One British runner, Sabrina Pace-Humphreys, set the challenge herself to complete MDS for her 40th birthday. She said that she had never dared to run in such an inhospitable environment, yet alone for days on end. The SPOT Gen3 reassured her that even when she was all alone in the desert, help was never far away. Her family and friends at home told me they felt like they were on the journey with her as they watched her progress using SPOT’s tracking data. 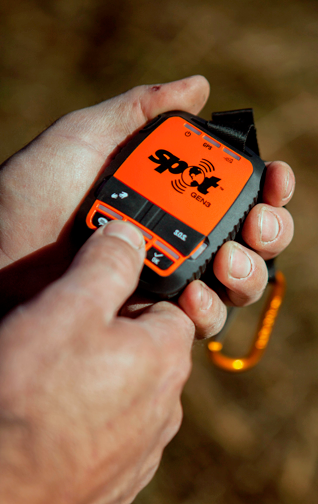 Patrick Bauer, CEO of the MARATHON DES SABLES, added that the SPOT system has amply proven its value over the years, both for its ability to provide reliable tracking of all MDS participants and to help ensure support can be rapidly delivered to competitors when they need it most. Gavan Murphy, Director of Marketing, EMEA, Globalstar, noted that participants in MARATHON DES SABLES push themselves to their very limits, physically, mentally and emotionally. The SPOT Gen3 and the Globalstar satellite constellation will deliver safety and peace of mind to this extraordinary group of people and to the dedicated MDS team supporting them.